We are pleased to share with you the details for the PREMIERE Screening of the two short films made in Robinvale by our young filmmakers! 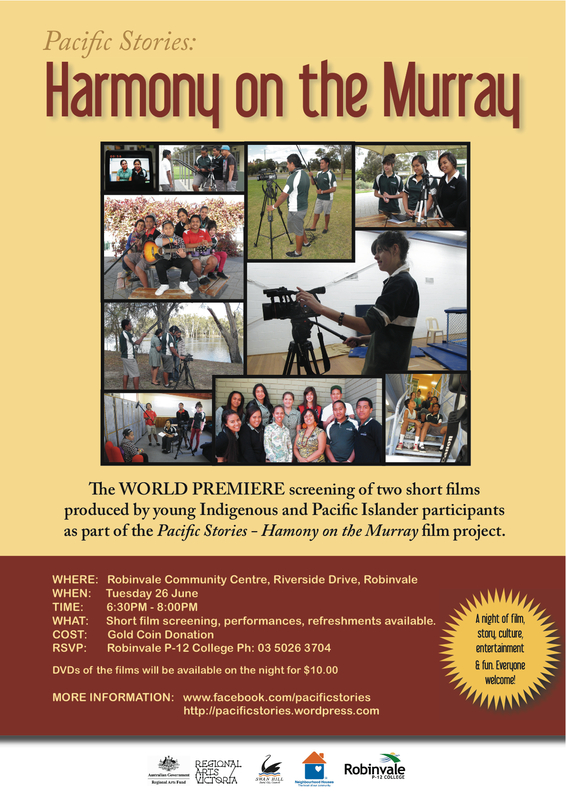 On Tuesday 26 June we will screen the films in Robinvale along with a few films from Pacific Stories 2011, have some performances and also hopefully have a guest filmmaker to talk at the event – we will let you know when this is confirmed. CLICK HERE for the Harmony on the Murray Facebook Event. The WANKTOK STORI Film Screening Fundraiser EVENT – A night of film, storytelling and fun. • Pacific Stories DVD available at discounted price. Cost: $20 entry to be paid at the door (includes light refreshments). A screening of short films from Melbourne’s Pacific Islander community. Join us for a night of sights, sounds and storytelling Pasifika style! This evening is the culmination of Pacific Stories – a storytelling and film project that started in December 2010. Participants have roots in many different Pacific nations – West Papua, Fiji, Tonga, PNG to name a few – and have come together in this project to share their stories through learning filmmaking techniques and the developing their own short film. The screening will be followed by Pacific food and entertainment. This is a night not to be missed. HI this is great, however just a query is this only for those living in Victoria or interested PNGuinean filmmaker living in PNG can participate in future events. Thanks for your comments. It’s great that you have heard about us! 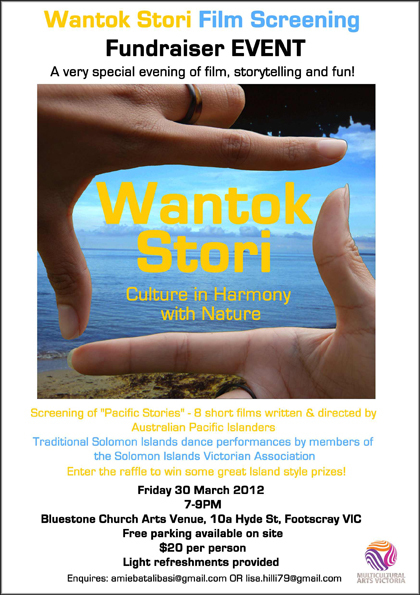 You might like to hold a screening of the Pacific Stories films in PNG? Just an idea? We would love to do a tour of the Pacific and do filmmaking classes all around the islands – but we would need big funding for that!